We encourage you to put in your votes for your favorite businesses in Boulder. 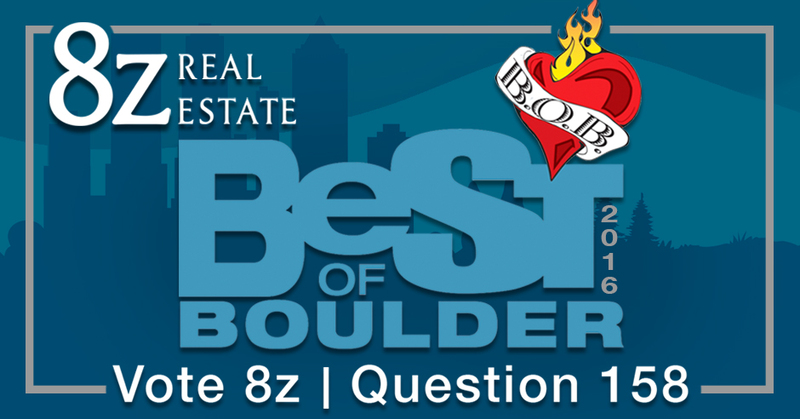 If you want to vote for us, here’s how: Go to Best of Boulder and fill in your information to start the survey. The Real Estate question is #158 on the survey. Click the drop down and select 8z. You must vote in 25 categories to for your ballot to be counted. For those of you who don’t know what Best of Boulder is, it’s a time when you get to pick your favorites of Boulder County for every category. These range from Best Breakfast to Best Music Venue. Voting is open now and closes March 31st. All winners will be recognized in Boulder Weekly’s annual Best of Boulder edition, which publishes in April. We already know that 8z is a great company. Let’s let the rest of Boulder know too!